Everyone seems to be scrambling to utilize social media in any way they can. High levels of engagement are what it takes to successfully market your company’s presence within the various social media platforms. However, engagement can’t happen without having fans and followers to engage with. One extremely popular method of encouraging engagement is hosting giveaways. Brands of all sizes have been participating in giveaways and contests to increase their audiences and in most cases do so quite successfully. Primarily brands have stuck with Twitter and Facebook for these promotions, while others have experimented with foursquare, YouTube and other channels ready to feature promotions. What are the different types of social media giveaways and what conversions are the marketers behind these sweepstakes trying to achieve? Today I’ll try my darnedest to explore both questions. The is the most common form of social media giveaway seen on Facebook and Twitter. Many brands host a deal where fans simply like a Facebook Page or follow a specific Twitter account and are given something for free after doing so. Not every company can afford to give every person who begins following their account something in return, but when you’re a big name brand it’s certainly the way to go. Facebook promotion guidelines changed as of December 2010, so it’s against their terms of service now to have a giveaway where the user only has to like the page to be entered. The guidelines now require users to enter more information as official entrance into the contest through a third party application. Bruegger’s Bagels is currently running a promotion of this nature on Facebook, giving all fans that like their page access to a coupon worth 3 free bagels on February 8th. What a great idea to encourage word of mouth about the Bruegger’s brand and not to mention an awesome chance to snag some free bagels! Currently 123,245 people like this page but that is bound to go up with the quick spread of content on Facebook and the option right below the coupon to share this with family and friends. 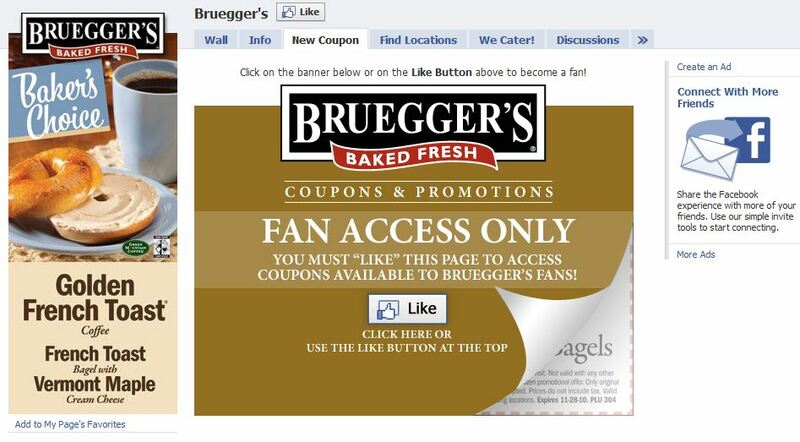 The conversion for Bruegger’s with this promotion is getting more likes on Facebook. By making the offer extremely easy to complete, announcing the offer throughout their marketing channels (on their website, on Twitter and elsewhere) and giving something of value to the consumer, Bruegger’s is utilizing this form of giveaway very successfully. More likes on Facebook equals higher levels of engagement, which will hopefully bring heightened brand awareness and profit for Bruegger’s. Some giveaways are more costly than others, requiring an organization to offer prizes to only a select group of winners. This type of giveaway is also used when running longer promotions. If the Bruegger’s giveaway were running until June instead of February, they might not have had the ability to offer the coupon to everyone for that extended period of time without incurring major costs (possibly outweighing the benefits of gaining larger social networks). Giving away products to a limited amount of contestants over a longer period of time adds an element of surprise that often excites the winning user to discuss their prize and astonishment on their social network. Troy Polamalu plays the strong safety position for the Pittsburgh Steelers and as a football player, he really has his foot in the door when it comes to social media. 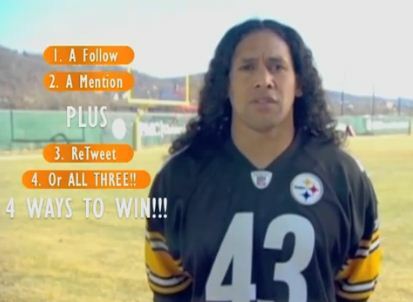 With active accounts on both Facebook and Twitter, Polamalu as a brand has begun a Steeler tickets giveaway to help both spread awareness of TwitChange and to gain more followers within his networks. By requiring users to follow @twitchange, @OOIAL and @tpolamalu and tweet this specific message: I might win #TroyTickets to the AFC Title game because I follow @tpolamalu @ooial and @twitchange Details at http://bit.ly/gF66N7 users must join his network, while also sharing the information with other users within their network. This sends awareness of the giveaway much further than if it merely required users to follow Polamalu’s account on Twitter without tweeting about it. The AFC Championship tickets are not a cheap or easy to come by commodity, which makes the promotion limited to a few recipients and seem more high stakes. This promotion also features a Facebook component which helps extends the audience it can reach, while making it consistent on all marketing channels. It’s hard to get users to copy and paste specific text for posting because let’s face it, people are lazy. This is one reason why giveaways that have simple instructions tend to have higher conversion rates overall. Because of the high profile prize and the fact that this contest benefits charity, many users have and will go the extra mile to enter the contest. Would people go the extra step for free bagels or free ice cream, maybe? Many companies run a sweepstakes once a quarter or once a year due to the fact that contests lose their edge if they are continually running year-round, not to mention the constant flow of money a never-ending contest requires. Instead of running a giveaway many Facebook pages choose to run fan-exclusive content, which is obviously only available to existing fans of the Facebook Page. Whether it be exclusive industry tips, articles, access to coupons or any other content limited to fans who connect with your channel, it’s another way to encourage engagement and do so with limited or no cost to your company. 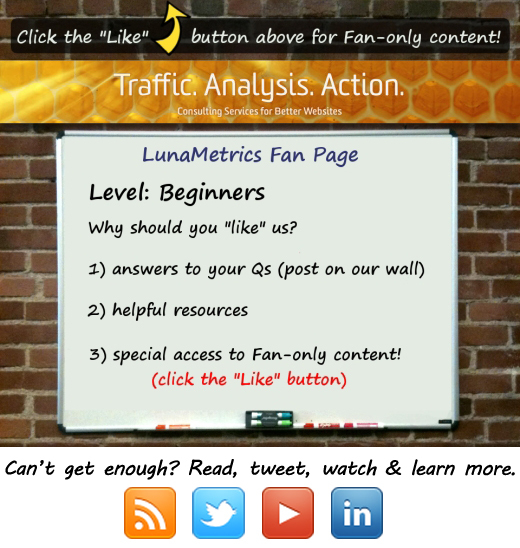 Here at LunaMetrics we utilize our Facebook page to a variety of audiences within our industry. In an effort to encourage engagement and increase our connections within the industry, we’ve developed a fan-only content tab that is exclusive to fans who like our page. Once a fan likes our page we provide weekly tips and tricks related to Search Engine Optimization and Google Analytics on our fan-only tab. These helpful insights allow us to share our expertise in our industry, while receiving more fans and expanding our network within this particular platform. What other types of social media contests, giveaways & sweepstakes have you implemented? Have they been a helpful way of encouraging engagement in your social media niches? Share your feedback below.